After a 4×4 off-road adventure from Puning Hot Springs, we proceeded to the next station where we were treated to a sand spa and mudpack therapy. 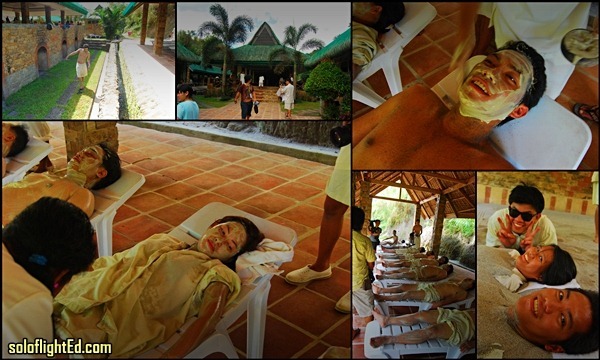 I first heard about a volcanic ash spa when I read an article by a fellow blogger. 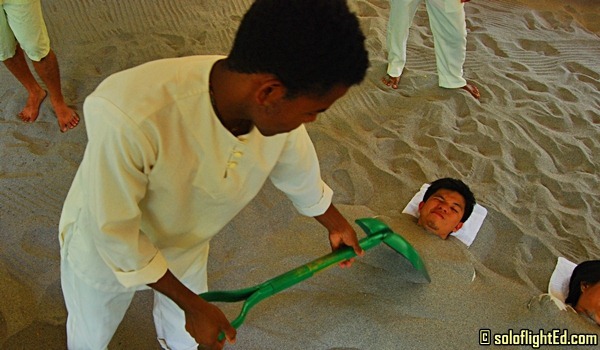 I didn’t really know what to expect except for being buried alive in sand and volcanic ash. There’s also an oven below where they place coals to maintain the warm temperature. 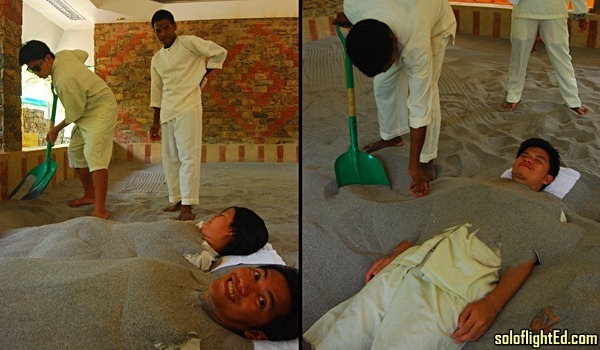 We were advised that the sand spa experience helps improve blood circulation. This only lasts for 20-30 minutes to avoid dehydration. Funny how I thought that we needed to be stripped to our boxers/undies while they poured sand on our bodies. It turns out that they have clothes for us to wear. Phew! 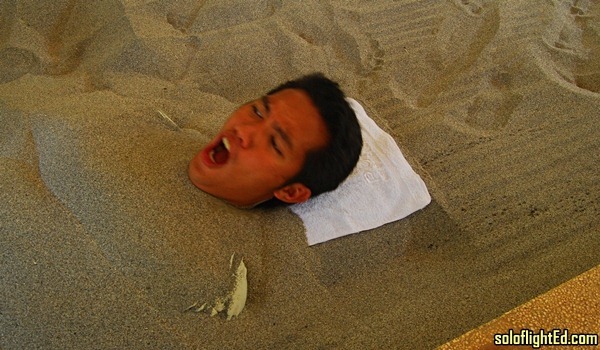 After my body was buried in the sand, it was only a matter of seconds when I started sweating. The attendant was quick enough to wipe the sweat off my face. Apart from the wipe, I also made another request. Don’t you just hate it that when your face gets itchy, it has to be when your hands are not free? In several moments, I also requested if she (the attendant) could also scratch a spot on my face because it became itchy. I felt embarrassed but I couldn’t do anything since my body was buried. She gladly granted my request. The next few seconds became a game of “higher, higher, lower” since I could only use my mouth to direct which area was itchy. Me: Higher, please. Higher. Opppp, too high. A little lower… There! I don’t like telling people what to do. Much more in this case because it felt like I was ordering the staff, but I was helpless. When she finally hit the right spot, it was pure bliss. I thanked her countless times and she returned the thanks with a smile. After the sand spa, we dusted ourselves off and proceeded to another area for our mudpack treatment. Cold sulfuric mud was applied to the skin and was left to dry. The muddy mudpack treatment is known to improve skin complexion and acts on skin spots and patches to reduce them. I remember getting more mud from the coconut husk and lathering another layer even if my body was already covered. A move I later regretted because it took me the longest to finish scrubbing the mud off in the showers. Overall, this was was a refreshing experience. It’s my first time to have this type of pampering for myself and I felt relaxed afterwards. The rest of the group did, too. 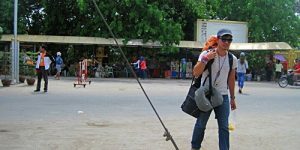 The package tours in Puning costs about 3000 Php per person (minimum of 2). 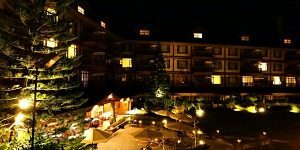 This tour consists of a 4×4 Rental, Entrance to the Hot Springs, Sand Spa, Mudpack, Lunch and Foot Massage. Panalo talaga ang drama ng last pic! 🙂 Ganda ng posing ni Christian at Angel! @Kara: ahaha. 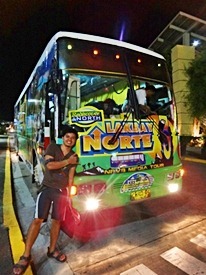 kakamiss ang LN3!